This time of year can be meaningful as a time of remembrance of God's love for us. But, the message and the meaning can also get lost in the commercialism and materialism that surrounds the holiday too. I am constantly looking for resources to reinforce the importance of the true meaning of Christmas. 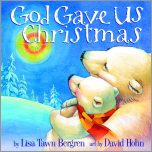 Lisa Tawn Bergren's book, God Gave Us Christmas is an excellent book designed to reinforce the fact that GOD gave us Christmas because of His love for us. I was at a mom's group yesterday evening where many moms discussed Santa Claus and how their family handled Santa. I loved the quote in this book where mama bear tells her cub, "Santa Claus reminds us about many good things like generosity and care. But it is God and Jesus that we celebrate most come Christmas. We always want to thank God for giving us Christmas." The illustrations are captivating and beautiful. This book is a treasure that I hope to keep and read as a holiday tradition for a long time! I also had an opportunity to review God Gave Us Love by the same author. While this book doesn't mention Christmas specifically, it does teach that love comes from God and God gives us love to give to others, which is certainly appropriate during the holiday season. It also tenderly explains that love is a choice and not always a feeling. The use of a patient Grandpa bear to explain these concepts to the cub is truly endearing. You can check out more info on these books here and here. These books were provided by Waterbrook/Multnomah Publishers for review.